The character was inspired by British rock 'n' roll singer Vince Taylor, whom David Bowie met after Taylor had a breakdown and believed himself to be a cross between a god and an alien, though Taylor was only part of the blueprint for the character. Other influences included the Legendary Stardust Cowboy and Kansai Yamamoto, who designed the costumes Bowie wore during the tour. The Ziggy Stardust name came partly from the Legendary Stardust Cowboy, and partly, as Bowie told Rolling Stone, because Ziggy was "one of the few Christian names I could find beginning with the letter 'Z'". He later explained in a 1990 interview for Q magazine that the Ziggy part came from a tailor's shop called Ziggy's that he passed on a train, and he liked it because it had "that Iggy [Pop] connotation but it was a tailor's shop, and I thought, Well, this whole thing is gonna be about clothes, so it was my own little joke calling him Ziggy. So Ziggy Stardust was a real compilation of things." Bowie recorded the song for the BBC radio programme "Sounds of the 70s: Bob Harris" on 18 January 1972. This was broadcast on 7 February 1972. On 16 May 1972 Bowie again played the song at "Sounds of the 70s: John Peel", and this was broadcast on 23 May 1972. Both of these versions were released on the Bowie at the Beeb album in 2000. A live version recorded at Santa Monica Civic Auditorium, 20 October 1972 was released on Santa Monica '72 and Live Santa Monica '72. 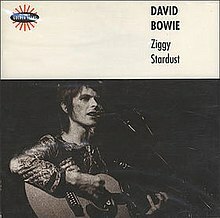 This version also appeared on the Japanese release of RarestOneBowie. It was also released as a single in France and the United States in 1994–95. The version played at the famous concert at the Hammersmith Odeon, London on 3 July 1973 was released on Ziggy Stardust: The Motion Picture. A spring 1978 performance from the "Heroes" tour was released on Stage and as the B-side of the live single "Breaking Glass" in 1978. A summer 1978 performance was included on Welcome to the Blackout, released in 2018. A November 2003 live performance from the A Reality Tour was released on the A Reality Tour DVD in 2004, and is included on the A Reality Tour album, released in 2010. The British gothic rock band Bauhaus recorded a version of "Ziggy Stardust" as their eighth single. The single was released in October 1982 through Beggars Banquet Records and reached number fifteen on the UK Singles Chart. The B-side is a Brian Eno cover. It was released in 7" and 12" format on the Beggars Banquet label. The 12" additional live track "I'm Waiting for the Man" is a Velvet Underground cover. A cover of this song, featuring a solo after the second chorus, appears in the 2005 music video game Guitar Hero. ^ "Happy 43rd Birthday to Ziggy Stardust". Retrieved 16 June 2015. ^ "Ziggy Stardust – David Bowie". allmusic.com. Retrieved 5 November 2010. ^ "BBC – BBC Radio 4 Programmes – Ziggy Stardust Came from Isleworth". bbc.co.uk. Retrieved 5 November 2010. ^ "The Leper Messiah : Vince Taylor". davidbowie.com. Archived from the original on 27 July 2011. Retrieved 5 November 2010. ^ Mahoney, Elisabeth (20 August 2010). "Ziggy Stardust Came from Isleworth – review". London: guardian.co.uk. Retrieved 5 November 2010. ^ Scott Schinder, Andy Schwartz (2008). Icons of Rock. Greenwood Publishing Group. p. 448. ISBN 0-313-33846-9. Retrieved 5 November 2010. ^ Shelton Waldrep (2004). The aesthetics of self-invention: Oscar Wilde to David Bowie. U of Minnesota Press. pp. 111–112. ISBN 0-8166-3418-1. Retrieved 5 November 2010. ^ "the album review site: La Roux Gets Sidetracked". album-review.co.uk. Retrieved 5 November 2010. ^ Michael Campbell (2005). Popular music in America: the beat goes on. Wadsworth/Thomson Learning. ISBN 0-534-55534-9. ^ "David Bowie interview by Paul Du Noyer 1990". Pauldunoyer.com. 25 August 2009. Retrieved 26 April 2011. ^ "ziggy stardust - Search Results - Pushing Ahead of the Dame". ^ Ruud Altenburg. "David Bowie - Illustrated db Discography > Ziggy Stardust CD-single". ^ "David Bowie Chart History (Japan Hot 100)". Billboard. Retrieved 31 January 2016. ^ Roberts, David, ed. (2006). British Hit Singles & Albums (19th ed.). London: HiT Entertainment. p. 45. ISBN 1-904994-10-5.